Hallow-e'en or Hallow-Even is the last night of October, being the eve or vigil of All-Hallow's or All Saint's Day, and no holiday in all the year is so informal or so marked by fun both for grown-ups as well as children as this one. On this night there should be nothing but laughter, fun and mystery. It is the night when Fairies dance, Ghosts, Witches, Devils and mischief-making Elves wander around. It is the night when all sorts of charms and spells are invoked for prying into the future by all young folks and sometimes by folks who are not young. In getting up a Hallow-e'en Party everything should be made as secret as possible, and each guest bound to secrecy concerning the invitations. 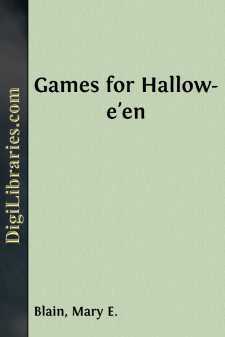 The room or rooms in which most of the games are to be played should be decorated as grotesquely as possible with Jack-o'-lanterns made from apples, cucumbers, squash, pumpkins, etc., with incisions made for eyes, nose and mouth and a lighted candle placed within. Jack-o'-lanterns for the gas jets may be made of paste board boxes about the size of a shoe box. Cut holes for eyes, nose and mouth in all four sides of the box and cover the holes with red or green tissue paper. A black box with the openings covered with red tissue paper or vice versa or white and green make good combinations. Cut a hole in the bottom of the box just large enough to fit over the gas jet, turning the gas low enough to not burn the box. In addition to this Jack-o'-lanterns made from pumpkins, etc., should be placed around on tables, mantles, corners, etc. A skull and cross bones placed over the door entering the house would be very appropriate. The hall should be in total darkness except for the light coming from the Jack-o'-lanterns of all shapes and sizes in various places.